Attend to the pleas of your people with heavenly care, O Lord, we pray, that they may see what must be done and gain strength to do what they have seen. Through our Lord Jesus Christ, your Son, who lives and reigns with you in the unity of the Holy Spirit, one God, for ever and ever. According to the 1962 Missal of St. John XXIII the Extraordinary Form of the Roman Rite, today is the feast of St. Hyginus. During the four years of his pontificate (138-142), he had to oppose the heresy of Valentinus who at this period came to propagate his errors in the heart of the Christian community in Rome. It is also historically the feast of St. Theodosius, abbot, born in Cappadocia in the village of Magarisso, who after having endured great sufferings for the Catholic faith, took his rest in peace at the monastery which he had erected on a lonely hill in the diocese of Jerusalem. The crown of the empire belonged to Antonius Pius. Hyginus, as Telesphorus' successor, not only had to endure his relentless persecutions but also had to cope with the heretics who made their way to Rome. Hyginus was a Greek from Athens who, like his contemporary Justin Martyr, was a philosopher. He is said to have done some organizing of the clergy, and it is likely that he addressed the Roman clergy on the subjects of sin in general and of obedience to the Church. The emergence of Gnosticism is probably the most significant development of Hyginus' pontificate. Cerdo came from Syria and Valentinus from Egypt, and together they taught this system of mystical belief, which was a combination of Greek philosophy and Oriental superstitions regarding Christ. For years Cerdo vacillated between teaching error and repenting, returning to the Church, then falling from grace. 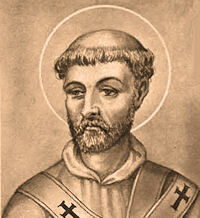 Valentinus, however, staunchly defended his cause. Hyginus perceived this as heresy, for it deviated greatly from the true teachings of the Apostles. Hyginus was said to have suffered gloriously and he was buried on Vatican Hill. St. Theodosius was so inspired by Abraham's example of leaving his loved ones and homeland for God that he left his homeland of Cappadocia to make a pilgrimage to Jerusalem. There St. Theodosius took as his guide the holy man Longinus, who placed him in charge of a church near Bethlehem. Theodosius did not stay there long, however, but he went to live in a cave on a nearby mountain. He was known for his holiness, and many desired to dedicate their lives to God as monks under Theodosius. He built a monastery at Cathismus, as well as three hospices: for the sick, the elderly and the mentally ill. 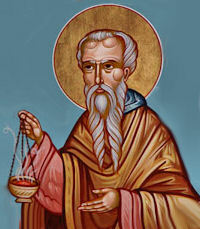 When Emperor Anastasius was persecuting Christians who did not accept the Eutychian heresy, which states that Christ has only one nature, St. Theodosius preached orthodoxy throughout Palestine, even stating from the pulpit in Jerusalem: "If anyone receives not the four general councils as the four gospels, let him be anathema." The Saint renewed the courage of those in whom the Emperor's edicts had instilled fear. Anastasius banished Theodosius, though he was later recalled by Anastasius' successor. Theodosius died at the age of 105; many miracles occurred at his funeral.